Scott and Lucy’s Wedding is an instrumental track featured on fiddle player Eilidh Firth’s debut EP ‘Searchlight’. The tunes featured on this track are ‘Scott and Lucy’s Wedding’ written by Eilidh and ’20 Years’ by Californian fiddler Seán Wood.This EP showcases contemporary and traditional tunes from Eilidh’s native Scotland, alongside tunes gathered on her travels across America. Eilidh is joined on this recording by Alistair Iain Paterson on piano and Alice Allen on cello. Eilidh Firth is a Glasgow-based fiddle player specialising in Scottish traditional music. Eilidh was inspired to pursue a career in music following a trip to Alasdair Fraser’s Valley of the Moon Scottish Fiddle School in California at the age of 15. Since graduating from the Royal Conservatoire of Scotland, Eilidh has been a member of the Scottish folk band ‘Barluath’ for five years, with whom she has toured extensively around the UK and Europe. 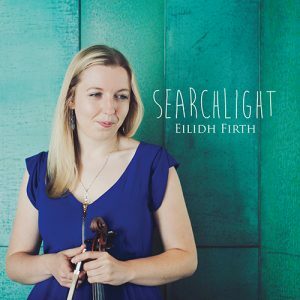 2016 sees the release of Eilidh Firth’s solo EP ‘Searchlight’ that showcases her own work as a dynamic performer and composer.